I love surprising people so this is my chance to surprise 5 people at once. 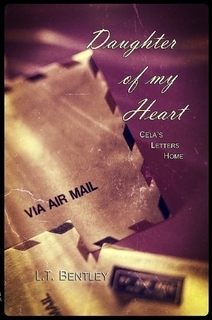 I have a contest running on Goodreads.com for a free signed copy of Daughter of My Heart: Cela’s Letters Home. I hope you are one of the lucky winners. I can’t wait to share this story with you. I wonder sometimes if there is a “perfect” writer. You know the one. The person who devotes a specific number of hours a day to their craft and yet still manages to have a life outside of writing. The one who cranks out 2-3 best selling books a year and who has stories to spare. The one who’s witty, charming; the one everyone wants to listen to and never grows tired of. All I know is that isn’t me. I’ll go weeks, sometimes, months without writing. Then a creative wave will hit me, sweep me off my feet, and I’ll plunge under it, to emerge a month or two later with a the skeleton of a story that lacks only fleshing out to make it complete. I will find myself asking by what right do I call myself an author. It seems to me that I’m a feast or famine author. Either I have a story racing through my head that clamors, no NEEDS, to be written so that I can’t rest until the story is out on paper or it drives me insane and interrupts my sleep. I’ll sit and stare at my computer screen for hours on end, wondering why the story I WANT to write, can’t get beyond the first few pages before it is mired in drudge so deep that i forget where the story night have gone. As an author, I find it frustrating and yes, I tend to feel somewhat guilty, that I am not even in the same category as what I THINK a true writer is; that perfect writer I carry around an image of in my mind. I’d love to be her someday.